“Spooner tackles a huge cast of characters…with astonishing sharpness and clarity.”…The Guardian. 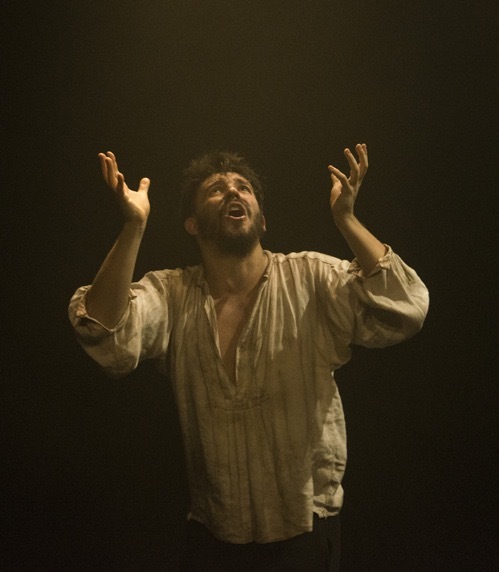 “Magnificent production…an astonishing performance.” ..The Stage. “Go and see this show right now. As a mime he is flawless, as a storyteller he is utterly compelling. “As we walked up the winding staircase to Underbelly’s Big Belly space the walls were dripping with what felt like the sweat of a thousand performers and audience members. We ducked into the venue and the air was thick. The scene was set for an intense 75 mins of possibly the best physical theatre you’ll see in this year’s Fringe. The Lecoq-trained company Rhum & Clay present Dario Fo’s 1969 comical mystery play, Mistero Buffo, with a furious energy and technical skill that was absolutely deserving of the standing ovation it received. Julian Spooner is the Jongleur. An itinerant performer from the middle ages who is given the freedom to speak truth to power by Jesus. He roams from city to city, performing to the assembled crowds (that evening, we were his crowd), telling versions of stories from the Bible that attack the powerful in favour of the people. Fo’s play, translated by Ed Emery and tweaked by Rhum & Clay, is the foundation on which a formidable performance by Spooner is built. It’s the solo performance at the centre of Mistero Buffo that’s remarkable here. It’s the way he shapes and transforms the space as the stories and scenes unfold. It’s the 100+ characters he flickers between with ever-increasing rapidity, climaxing at the resurrection of Lazarus where he conjures up an entire crowd out of thin air. As a mime he is flawless, as a storyteller he is utterly compelling. But Mistero Buffo isn’t merely a technical marvel. Fo’s text is subtly spun through the lens of modern itinerant and gig-economy workers, sliding this 50-year-old spectacle gently into contemporary relevance. There’s nothing heavy-handed about the way that Rhum & Clay present it though: it deftly dances between the timeless and the modern. After the standing ovation had died down, Spooner did a customary ‘thank you’ to the audience, and mentioned the workers rights organisation (organise.org.uk) they have partnered with. The story of the Jongleur and the downtrodden people he speaks for is insanely relevant today. In fact I would have loved to see a little more of that in the piece. More relation to the “corporate-dominated post-truth world” that they talk about in the blurb. But it’s a minor criticism, and the opening scene sets this up nicely.